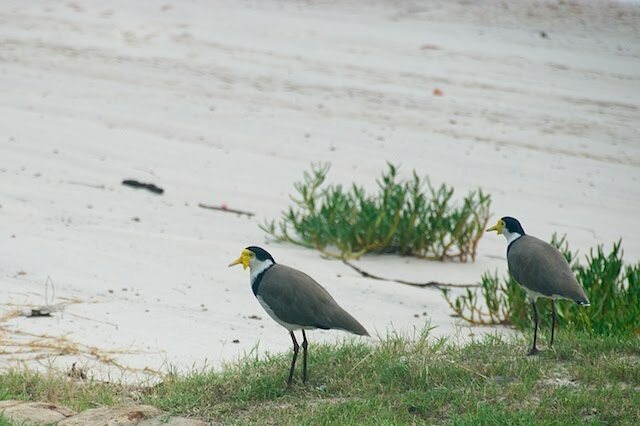 It's dull and overcast and this pair of Race novaehollandia (Spur-winged Lapwings) just loved plodding up and down Papa's Beach occasionally finding whatever it is they were looking for. They are pretty timid, and I normally wouldn't worry about trying to stake them out with a too-short lens, however we cannot be certain that we have sufficient time remaining here to get that perfect souvenir! I always thought of these as Spur-winged Plovers. Is that the same creature different name? When I was walking over Garden Island on Sydney Harbour, there was a sign warning to be careful of the SWP in one section as they would chase and attack you! Maybe that is only in the nesting season. There are as many plovers as there are sandpipers I believe!